Well hey there, December! You always sneak up on me and this year I'm ready for the most wonderful time of the year. It's easy to get overwhelmed by the lists, the parties, the so many things to do. Let's take this month one day at a time and enjoy the festivities! I'll be sharing simple recipes to feed the soul. I was born in the kitchen and I hope you'll come along for the fun! Fresh citrus is my favorite fuel. It's perfection in this nutritious sipper. If time permits, freeze the tangerine segments and banana slices (ideally, individually freeze them, then pack in freezer bags for easy access and smoothie bliss). 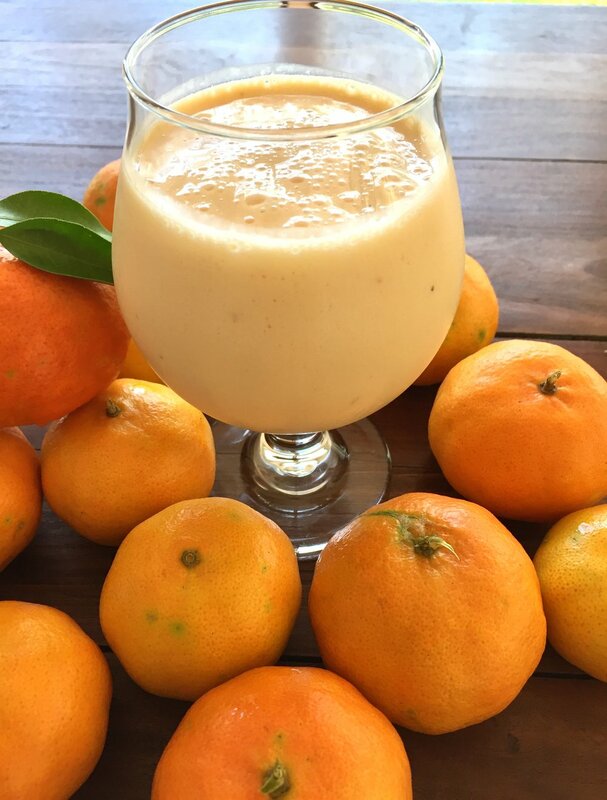 Combine the tangerine, banana, yogurt, and juice in the container of a blender. Mix on low to blend, then increase the speed and drop in the ice. Blend until creamy, dreamy. Pour into 2 glasses and sip away! Cooking is contagious. The joy spreads with each swipe of the rolling pin, the aromatherapy of a burst of lemon, the chime of the oven timer. Imagine the joy spreading to children, the sum of their ages equaling less than half of mine. I’m in heaven. “Keep the menu simple with plenty of hands-on to keep the energetic group focused,” I reminded myself as I planned the class. Pita bread and some colorful roasted vegetables seemed like the right fit. During the growing season, these petite chefs are gardeners with the SCRATCH project, an after school “grow to eat, eat to live” program in Huntington. Their sweet potato harvest sold out at The Wild Ramp and they would be planting summer squash next. The dough doubled on the drive from Charleston to Huntington, a quick hour west on the interstate. Veronica unlocked the door. “Welcome to Huntington’s Kitchen!” This teaching kitchen, originally installed by Jamie Oliver in 2009 is a cooking instructor's fantasy: A full wall of ovens plus four prep areas and one for the instructor, each equipped with a cooktop and kitchen tools. I am in my element and I'm committed to the commute. I had a half hour to unpack and preheat the ovens before the tempo increased. The pizza stone and cast iron griddle needed to be blazing hot for the pita, and the second oven was readied for roasting the vegetables. Huntington's Kitchen is now a collaborative teaching kitchen which partners Cabell-Huntington Hospital and Marshall University Department of Dietetics to enhance, promote, and improve healthy eating. Suddenly it’s showtime and when you are surrounded by hungry kids in the kitchen, you can’t miss a beat. I show them why you have to poke holes in the whole vegetables before roasting them, then slide the sheetpan loaded with sweet potatoes and zucchini into the oven, out of sight. Now for the dough. They saw a puffy globe flop onto the prep table. We got to discuss what it looked like before the drive. It was a softball, way down inside the bowl, now its crown reached the plastic wrap. We use a butter knife to cut it in half, then each half into two again. And again. It’s math without a worksheet. Each of our eight bits of dough land in a set of tiny hands and are shaped into large golfballs, pressed flat in a sprinkle of flour, and rolled out into a thin pancake. Then you take away one, more math, and you have seven -- the five second rule does not apply, but laughter prevails. In a perfect world, there would be a set of identical rolling pins, but we make do, sharing our mis-matched collection. Two at a time and for just three long minutes our flatbreads bake on our hot stone and griddle, puffing into a mylar balloon or blistering like a tortilla, depending. Then we wait. With wide eyes, the pint-sized bakers can witness the steam escaping from their rounds of handmade bread and it’s time to make something delicious for dipping. We smash, then peel, whole cloves of garlic, and pass around lemon wedges for squeezing. We have to fish out the seeds, enough for the SCRATCH kids to plant an entire citrus grove. Next time we will use a strainer. The roasted vegetables are now just cool enough to handle and we pass around the knives, butter knives, with a quick tutorial. Like a color by number, we toss them into the food processors, first green with its lemon and garlic notes, then the sweet potato with a hot pepper accent. We spoon our concoctions into ramekins and break our bread. I watch in awe as they tear their pita and rake it through their palettes of vegetable dips. 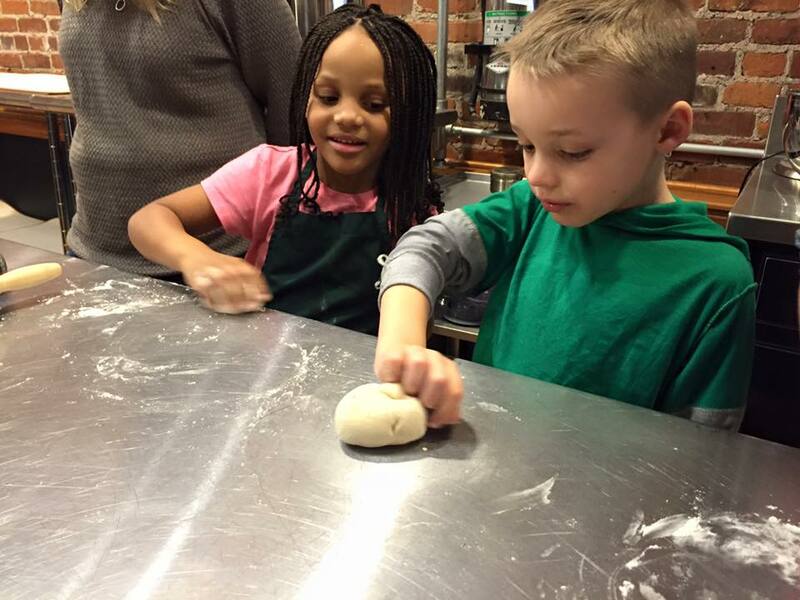 “I can’t believe we made bread and got to use a knife!” Junior, the lone 5-year old announced at the table. I think he caught the bug. Combine the whole wheat flour, unbleached flour, yeast, salt, and sugar in the work bowl of a food processor and pulse a few times to blend. Add the water and olive oil through the feed tube and blend until a smooth ball of dough forms. Let the dough rest in the work bowl for 10 minutes and check the consistency. Dough should be soft but not sticky. If it is sticky, add a bit of flour, 1 tablespoon at a time and pulse to blend. If the dough is too firm, add a bit of water, 1 teaspoon at a time. Blend the dough for 30 seconds and turn out into a large-ish bowl that has been lightly oiled with olive oil. Cover the bowl with plastic wrap and set aside to rise in a warm-ish place until doubled in size, about one hour. Place a baking stone or large cast iron griddle into the oven and heat the oven to 475. Lightly flour a work surface and turn the pillow of dough out onto the flour. Divide the dough into eight equal pieces, roll them into rough golfball shapes, then press each into a disk (all this handling is the kid-equivalent of kneading). Roll each disk into a 6-inch circle and feel free to discuss the merits of geometry. Carefully place one dough circle at a time onto the heated stone (or griddle) and bake for two minutes. Turn over with tongs and bake for one minute on the second side. Remove each pita to a basket or plate while you continue baking the whole batch. Heat the oven to 400. Place the sweet potatoes on a baking sheet and bake for about one hour, until soft (gently squeeze with a pot holder to check). Remove from the oven and let cool for a few minutes. Peel the sweet potatoes and roughly chop them, then place into the work bowl of a food processor. Add the olive oil, tahini, garlic, jalapeno, and salt. Blend until smooth, adding water as needed to achieve the desired consistency. Transfer to a bowl and serve with pita for dipping. Heat the oven to 400. Place the zucchini on a baking sheet and bake for about 45 minutes, until soft (gently squeeze with tongs to check). Remove from the oven and let cool for a few minutes. 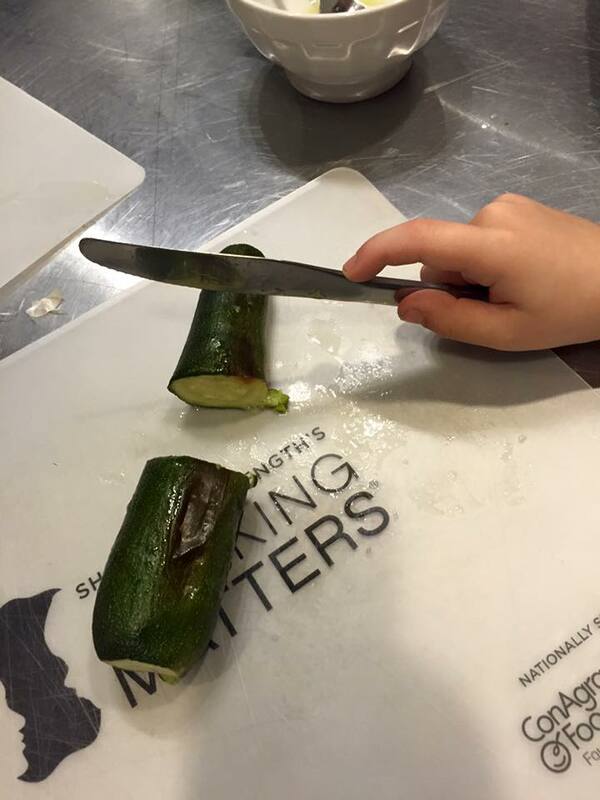 Trim off the stem end and roughly chop them (use a large cutting board to contain all the juice). Scoop the zucchini into the work bowl of a food processor. Add the olive oil, tahini, garlic, lemon juice, and salt. Blend until smooth with a few bits of the green skin freckling the dip. Transfer to a bowl and drizzle with a bit of olive oil for garnish. Serve with pita for dipping. How do you get a room full of kids (and their reluctant cooking teacher) to eat their just-harvested beets? Whirl them into some homemade hummus! When I was invited to cook with a group of students from SCRATCH, a community garden program focusing on youth who bring their farm to the table, I couldn't believe my luck. They arrived with about a bushel of beets which we scrubbed and roasted and then let the food processor do the work of turning our golden hummus into a hot pink discovery. Then it disappeared just as magically. These happy growers are amazing kitchen hands and I can't wait to see what they harvest next. Happy Cooking!